The following essay is the fifth in a series exploring the recent phenomenon in which a number of courts and legislatures have conferred legal personality on specific rivers (see first essay / second essay / third essay / fourth essay). The purpose of this series is to engage in a dialogue assessing the merits and value of such recognition, as well as possible implications. This essay is written by Deborah Curran, Associate Professor, Faculty of Law and School of Environmental Studies and Acting Executive Director, Environmental Law Centre, at the University of Victoria in British Columbia, Canada. She can be reached at dlc [at] uvic.ca. In Canada, the country with 20% of the world’s freshwater, our colonial legal history and the current expression of both colonial and Indigenous laws make for a unique context that does not necessary lend itself to the application of independent legal status or personhood for natural features such as rivers and mountains. While amendments to colonial law could grant legal status to rivers, many Indigenous legal orders place Indigenous peoples in a stewardship or caretaking relationship with water that they view as fundamental to their laws and culture. Devolving authority to an independent representative or tribunal and separating Indigenous people from direct responsibility for their environment is viewed as harmful to both people and ecosystem. Indigenous communities are responsible for maintaining relationships as part of their legal and cultural duties. Creating a third-party structure, even with representation, may not adequately adhere to Indigenous law. In addition, once communities agree to devolve decision-making authority to a third-party representative of a river, there is always the danger that the Crown – federal and provincial governments – may take the position that Indigenous communities then have less say in proposed development and impacts on the river. How independent structures representing a river could limit or change evolving Aboriginal rights and title is a significant risk for Indigenous communities. There is considerable energy going into revitalizing and expressing Indigenous laws in Canada, including entering into government-to-government agreements that amend colonial law. These acts of Indigenous law could result in protections for the natural environment and specific features such as rivers that are similar to those promised by granting independent legal status to rivers and the natural environment. At least in the medium-term, the focus in Canada is on revitalizing Indigenous laws to be an effective articulation of Indigenous authority and counterpoint to colonial environmental governance. There is no right to a healthy environment in Canada under current state or colonial law. The environment, except for fish, is largely the responsibility of provincial and territorial governments who have created a patchwork of different laws regulating the extraction of natural resources, parks, and pollution. All water law in Canada focuses on permitting the extraction of water rather than planning for watershed health, and none acknowledge Aboriginal rights to water as part of the water balance in a region. Since 1982, the federal Constitution Act affirms and acknowledges Aboriginal and treaty rights. Colonial courts have interpreted the scope of these rights to include the right to harvest for food, social and ceremonial purposes and carry out cultural practices in one’s historic territory. Beyond this bare right to harvest for a moderate livelihood and undertake activities that are “distinctive to the culture” of an Indigenous community, most court cases exploring Aboriginal rights focus on the Crown’s requirement to consult and accommodate First Nations when the provincial or federal governments make decisions about applications to use resources in the traditional territory of an Indigenous community. This duty is a procedural right and does not a guarantee a substantive outcome of a healthy environment, intact ecological relationships, or the ability to exercise one’s Indigenous laws. Recently, however, First Nations and colonial courts have turned to Indigenous laws and Aboriginal rights, as well as their expression in government-to-government agreements, as legitimate limitations on the decision-making authority of the federal and provincial governments, and as a way to challenge the natural resource regimes, including for water, under colonial law. As a multi-juridical society, there is a resurgence in the expression of Indigenous law in Canada, the foundation of which are the relationships and responsibilities between land, plants, animals, fish, marine ecosystems, and humans. Colonial law stands in contrast to Indigenous law, which encompasses the existing and evolving laws of each Indigenous society. Indigenous groups and communities in Canada continue to define and use their own laws. The land- and water-based origin of many Indigenous laws establish relationships and rules for protection, harvesting, cultivation, and trade of ecosystem elements. The origins of Indigenous laws flowing from ecosystem-based relationships also create the overarching governance processes through which entitlements to use, harvesting practices and sharing with adjacent communities are mediated. The Tsleil-Waututh Nation conducted their own environmental assessment of the Trans Mountain pipeline expansion proposal using their Stewardship Policy derived from their Indigenous laws as the assessment framework. Tsleil-Waututh and Coast Salish Legal principles include the “sacred obligation to protect, defend, and steward the water, land, air, and resources of our territory…the responsibility to maintain and restore conditions in our territory that provide the environmental, cultural, spiritual, and economic foundation our nation requires to thrive”. The Stewardship Policy requires the Nation to evaluate the potential negative effects of proposed development, and if those effects do not exceed “Tsleil-Waututh legal limits”, to assess the benefits of the project for the community. As part of the assessment process, the Tsleil-Waututh First Nation revealed their stewardship obligations in their territory, based on their Indigenous laws and operationalized through their Burrard Inlet Action Plan, which includes regulatory action and habitat restoration by the Tsleil-Waututh. Likewise, the Stk’emlúpsemc te Secwépemc Nation also undertook a community assessment of the proposed Ajax mine near Kamloops, British Columbia. Concluding that the Nation would not give its free, prior and informed consent for the project, the process included the Nation exercising its own Indigenous environmental governance to strike an assessment panel. The decision document underscores the importance of the ethics of stewardship embedded in socio-ecological relationships and expressed in Secwepemc lands and resource laws. Other examples of expressions of Indigenous laws that challenge colonial administrative and legal processes abound in Canada, particularly on the west coast in British Columbia. Many of these expressions involve water as the basis of life. The Nadleh Wut’en and Stellat’en First Nations, as well as the Okanagan Nation Alliance, have made declarations of water law and are developing programs and policies flowing from these declarations. A central tenet of these expressions of law is the relationship of these communities to their lands and waters, and their ongoing responsibilities to take care of the ecosystem’s health. Currently in Canada, there is a movement to revitalize Indigenous laws and to enable those laws to express jurisdiction, sovereignty and interact with colonial law as one of the long-term results of reconciliation. Permitting the full expression of Indigenous laws may mean granting legal status to some rivers as part of government-to-government agreements, however, such an approach would follow first the concrete expression of Indigenous legal orders and long-term discussions about the appropriate ways to enliven those orders in conversation with colonial law. A legitimate concern is that colonial legal processes or governments could weaken the intent of legal status for rivers vis a vis evolving claims for Aboriginal rights and title. While Indigenous communities would sign-on to such an approach as a way to secure better protection for the natural environment, and thus the underlying conditions of their Aboriginal rights such as fishing, hunting, gathering, and ceremonial practices, the Crown may argue that First Nations’ interest in applications for development or extraction of natural resources is diminished because the river had independent representation. Indigenous influence on potential projects could be limited to direct impacts to Indigenous people and not the environmental health of the river as an ancestor, spiritual entity or condition of life. There may be opportunities in the medium- to long-term where expression of Indigenous laws include government-to-government agreements that point to legal personhood, as was the case in New Zealand. Several productive government-to-government agreements exist in Canada. For example, the Haida Nation entered into the Kunst’aa guu – Kunst’aayaa Reconciliation Protocol with the Province of British Columbia to create the Haida Gwaii Management Council. The Council makes decisions about forestry and heritage sites, and is composed equally of appointees of the provincial government and Haida Nation, with decisions made by consensus. Another example is the Great Bear Rainforest Agreements between the seven First Nations in the Central Coast of British Columbia and the provincial government, which agreed to return 80 percent of the landscape to old growth forest over a 250-year timeframe and to support a conservation economy. While the legal mechanisms in colonial law for realizing these agreement are complex, the provincial government operationalized the forestry commitments through the Great Bear Rainforest (Forest Management) Act, which establishes the annual allowable cut for the area as agreed to pursuant to ecosystem-based management. Much of the landscape is designated in a new type of park called conservancies that permit the exercise of Aboriginal rights. Finally, granting independent legal status and a voice to a river might make sense in unique areas where there are many overlapping claims and legal structures affecting a body of water, and where decision-making authority and priorities require clarity. An example is the Peace Athabasca Delta, a UNESCO World Heritage site and part of the larger Peace-Athabasca-MacKenzie River system. Flowing through three provinces, two territories, and dozens of treaty and non-treaty Indigenous traditional territories, it is affected by some of the largest industrial tar sands and hydroelectric projects in Canada. While colonial legal processes have failed to provide effective governance for one of the world’s most important rivers, perhaps an independent governance body for the River itself could force reparations. Val Napoleon. What is Indigenous Law? The following essay is by Regina M. Buono and Jill Baggerman. Buono is a Non-resident Scholar at Rice University’s Baker Institute for Public Policy and a doctoral student at the LBJ School of Public Affairs at the University of Texas at Austin. She can be reached at regina.buono [at] utexas.edu. Baggerman is a fellow with the Robert Strauss Center for International Security and Law and the J.J. “Jake” Pickle Scholarship Program and is a graduate student at the LBJ School of Public Affairs at the University of Texas at Austin. She can be reached at kjmbaggerman [at] gmail.com. Despite oft-seen headlines about “the wall,” immigration, and uncomfortable relations between the United States and Mexico, the countries continue to develop advanced cooperative strategies for governance and management of the Colorado River. On September 27, 2017, representatives from the U.S. and Mexico signed Minute 323, a new agreement under the 1944 Treaty governing the river, which is intended to create a more secure water future for Colorado River water users and support additional environmental restoration projects. The agreement is the product of longstanding collaborative efforts by environmental NGOs, water agencies, and governmental representatives from both countries and is designed as a successor to Minute 319, signed in 2012. Minute 319 created temporary measures to share shortages and surpluses between the parties, and provided a massive, experimental pulse flow to rejuvenate the Colorado Delta. (See here and here). In a nutshell, Minute 323 authorizes mutually advantageous options to give the parties flexibility and facilitate longer-term planning of water storage and distribution under variable climate conditions. It provides for substantial investment in conservation projects in Mexico in exchange for additional water allocations to the U.S. Some of the more prominent stratagems of the plan are described below. Minute 323 delineates procedures for coordinating approaches to operating under specified tiers of high- and low-elevation reservoir conditions, allowing the parties to take advantage of wet times and avoid triggering shortages in dryer periods. This increases certainty for each nation in managing water demands, and provides for agreement on the provenance and communication of information regarding environmental conditions. The U.S. Bureau of Reclamation’s August 24-Month Study will be used to project the January 1 elevation of Lake Mead, thereby determining yearly basin-wide allotments. The agreement also establishes the Binational Water Scarcity Contingency Plan in which Mexico agrees to join the U.S. states in temporarily taking less water from Lake Mead in order to avoid future shortages. Implementation of the plan is contingent on completion of the drought contingency plan being developed by the lower basin states. Commissioners Roberto Salmon (left) and Edward Drusina of the Mexico-U.S. International Boundary and Water Commission Commissioners announce signing of a new Colorado River agreement, Minute 323 on September 27, 2017. Photo by the U.S. Bureau of Reclamation; Creative Commons Attribution-ShareAlike 2.0 license (https://www.flickr.com/photos/usbr/23522391918/in/photostream/). Minute 323 provides a number of rules to structure and facilitate sustainable management of these reserves, including limitation on total annual deliveries and provisions for evaporation losses. Reserves are to be delivered when needed unless Lake Mead is at low-elevation conditions or the timing would affect the January 1 elevation projection. Mexico may use its reserves for any purpose; may create a reserve of up to 250,000 acre-feet (AF) through December 31, 2026; and may withdraw up to 200,000 AF annually. Of water stored as ICMA, 2% is reserved for environmental purposes in Mexico. Minute 323 defines precise institutional procedures for when and how relevant agencies will manage the accounting records and release water deliveries. Storage and release procedures are based on the projected elevation of Lake Mead, meaning that environmental conditions and a recognized need for accurate evaluation and understanding of those conditions remain at the forefront of the agreement. Minute 323 addresses a number of other issues benefiting both nations but of particular concern to Mexico. The agreement lists tasks for the Binational Salinity Work Group to achieve over the next two years, including the modernization of salinity monitoring equipment and automatic reporting tools. The agreement also addresses Mexico’s concerns about daily flow variabilities by creating the Binational Flow Variability Work Group, tasked with a pilot program to use existing storage capacity at Morelos Dam to reduce variability. U.S. water agencies pledged to invest $31.5M in water efficiency projects in Mexico in exchange for an additional 109,100 AF in water allotments. Water savings generated by these projects will accrue to Mexico, except for allotments exchanged to the U.S. and specified allotments for the environment and system water. The water transferred to the U.S. will reduce pressure on the lower basin U.S. states as they attempt to meet increasing water demands. As with Mexico’s Water Reserve, the agreement coordinates institutional procedures for how the parties will conduct the exchange proportionally and simultaneously through 2026. Seeking to leverage the success of Minute 319’s “pulse-flow”, Minute 323 includes provisions for the environment, particularly the river delta. The parties renewed their commitment to the environment by agreeing to partner with a binational coalition of NGOs to generate 210,000 AF of water for environmental purposes in Mexico, and pledging millions of dollars to fund scientific research, monitoring, and restoration projects. Mexico will also provide water for continued habitat restoration and scientific monitoring in the delta through 2026. In sum, Minute 323 is an encouraging development for management of the river. The agreement provides Mexico and the U.S. with additional procedures and resources required to meet environmental and user demands for Colorado River water. Mexico benefits from increased flexibility regarding management of its reserves, as well as improved rules on flow variability and funds for conservation projects. The lower basin states also substantially benefit from the water transfers, which will lessen demand pressure throughout the system. The formal involvement of NGOs at the negotiating table increases the institutional capacity of both nations, creating incentives and synergies to facilitate conservation projects. The agreement is an indication that relations over the Colorado River continue to be strong and cooperative, are supported by well-developed institutions and active stakeholder participation, and increasingly focus on environmental sustainability and mutually advantageous solutions. Minute 323 advances each of these objectives, demonstrating that both nations continue to negotiate in good faith, even while the broader relationship becomes strained. Inter-State Water Law in the United States of America: What Lessons for International Water Law? The following essay by Professor Rhett Larson is a summary of his recently published monograph (under the same title), which appears in Vol. 2.3, 2017, pp. 1-82, of Brill Research Perspectives in International Water Law. Professor Larson is a Professor of Law at the Arizona State University School of Law. He can be reached at Rhett.Larson [at] asu.edu. John Wesley Powell was an 19th Century explorer of the western United States. In a report to the U.S. Congress, Powell recommended that the borders of future western states be based on watersheds and warned of the risks associated with political subdivisions sharing transboundary waters. Congress ignored Powell’s advice, and established western state boundaries with many inter-state waters traversing and, in some cases forming, sub-national borders. As a result, and as I discuss in my recent monograph published in Brill Research Perspectives on International Water Law, the United States has a long and colorful history of transboundary water management that provides both encouraging lessons and cautionary tales for international water law. For example, the common law doctrine of “equitable apportionment” developed by the U.S. Supreme Court in cases involving its original jurisdiction over inter-state water disputes is similar in many respects to the principle of equitable and reasonable utilization embodied in Articles 5 and 6 of the U.N. Convention on the Law of the Non-Navigational Uses of International Watercourses ( “Watercourse Convention”). Beyond the obvious use of the word “equitable” in the articulation of both the inter-state doctrine and the international doctrine, the factors set forth by the U.S. Supreme Court in determining equitable apportionment are similar to the factors laid out in Article 6 of the Watercourse Convention in determining equitable utilization. The U.S. Supreme Court considers “physical and climatic conditions,” and international law considers “[g]eographic, hydrographic, hydrological, climatic, ecological and other factors of a natural character.” The U.S. Supreme Court considers consumptive uses, while the Watercourse Convention includes considerations of the “effects of the use or uses of watercourses.” The U.S. Supreme Court considers wasteful uses, and the Watercourse Convention includes considerations of conservation options. Despite these similarities, the U.S. doctrine of equitable apportionment and the factors included in determining reasonable and equitable utilization under the Watercourse Convention have differences that are important to note for what each doctrine may learn from the other. The Watercourse Convention expressly includes consideration of population, which seems an obvious factor missing from inter-state water law. The Watercourse Convention also considers both existing and potential uses of the watercourse, while the U.S. doctrine of equitable apportionment considers only “consumptive uses,” not necessarily potential future uses. It might also be helpful for the U.S. doctrine of equitable apportionment to expressly factor in ecological considerations in a way similar to the Watercourse Convention, because those considerations may not always be adequately captured by the concept of waste embodied in the U.S. law. On the other hand, the U.S. equitable apportionment doctrine includes a cost-benefit analysis consideration that could be a helpful factor to evaluate equitable utilization in international water law. Additionally, the consideration of the character and rate of return flows under U.S. inter-state water law may also be a helpful factor to include in determining equitable utilization in international water law. In Bean v. Morris, an early equitable apportionment case before the U.S. Supreme Court, the Court identified an important factor when evaluating inter-state water allocations that could be incorporated into international equitable and reasonable utilization analysis. States in the U.S. typically rely on one of two legal regimes for allocation rights to water. The approach to water rights in eastern states is generally common law riparian rights based on English and Roman laws, under which rights are apportioned to owners of property abutting water bodies based on the requirement that uses be reasonable. The approach to water rights in western states is generally prior appropriation, with water rights based on a first-in-time, first-in-right scheme, subject to beneficial use requirements and the prohibition against waste. Neighboring U.S. states sharing transboundary waters can therefore have dramatically different approaches to allocating water rights and different policy aims in water management. These differences have aggravated inter-state water disputes over transboundary waters. The U.S. Supreme Court, in an early equitable apportionment case, sought to mitigate the impact of, if not reconcile, these different approaches to water rights. In Bean v. Morris, the Supreme Court held that it would apply principles of prior appropriation when allocating water between states that recognize prior appropriation as their own internal water rights system. International water law could similarly look to using domestic water law principles held in common between two nations sharing a watercourse as a factor in the evaluation of reasonable and equitable utilization. Such an approach would be a more targeted application of Article 38(1)(c) of the International Court of Justice’s statute authorizing reliance on “general principles of law recognized by civilized nations” in resolving international disputes. Nations are perhaps more likely to view such a factor as reasonable and equitable if based on domestic laws already accepted and legitimized under their respective domestic laws. Other potentially helpful lessons from U.S. inter-state water law for international water law may include the use of special masters to facilitate dispute resolution and the recognition and quantification of water rights held by indigenous peoples. Cautionary tales for international water law from U.S. inter-state water law include the inter-state problems created by the bifurcation of groundwater and surface water rights, and the over- or under-empowerment of basin-level, inter-jurisdictional commissions. Many countries with federal structures, like the United States, have been dealing with inter-jurisdictional water disputes for generations, and therefore could be fertile ground for cultivating ideas for reform in international water law. Posted in Brill Research Perspectives – International Water Law, International Water Law, North America, UN Watercourses Convention | Comments Off on Inter-State Water Law in the United States of America: What Lessons for International Water Law? The following post by Richard Paisley and Taylor Henshaw is the tenth and final essay in the series related to the entering into force of the 1997 UN Watercourses Convention (see links to all of the essays here). Messrs. Paisley and Henshaw are with the Global Transboundary International Waters Governance Initiative at the University of British Columbia in Vancouver, Canada, which Mr. Paisley directs. Mr. Paisley can be reached at: rpaisley [at] internationalwatersgovernance.com. 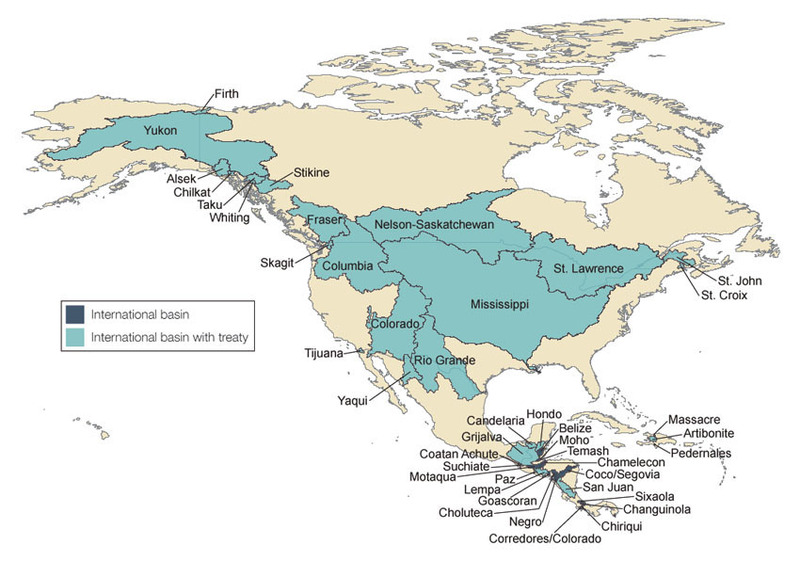 The nations of North America—Canada, Mexico and the United States (USA)—share a significant number of international drainage basins and transboundary aquifers, comprising 16% of the world’s transboundary river basins. The three countries have entered into various bilateral agreements with their neighbors for the management and allocation of their transboundary waters. However, while each voted in favor of the UN Watercourses Convention (UNWC) when it came before the UN General Assembly, none of them has ratified the instrument. The objective of this essay is to critically consider the absence of these three nations from the roll of the UNWC and to assess whether ratifying and implementing the UNWC would be in the individual and collective best interest of all three countries. The three nations appear to be in no great rush to ratify and implement the UNWC. This may be due to a perception that their international drainage basins are sufficiently managed without the UNWC: long-standing bilateral institutions have been established to deal with various aspects of the conservation and management of international drainage basins in North America. Prominent among these mechanisms are the International Joint Commission (IJC) between Canada and the USA, and the International Boundary and Water Commission (IBWC) between Mexico and the USA. The history and practice of the IJC and the IBWC provide a rich body of work to review that falls beyond the scope of this essay. Nevertheless, it is pertinent to mention some of the challenges the two commissions face, such as: managing significant risks to water quality and quantity; the linking of border environments to binational trade and associated agreements; new stresses on public health and national economies; changes due to population growth and industrialization; greater demands on shared resources; increasing emphasis on public and indigenous peoples participation in decision-making; greater value placed on non-traditional water uses, such as “in stream” flows; and the imperative to establish ecosystem and active adaptive management approaches to resource management. In addition, both institutions have experienced recent changes to their constituencies with the increasing influence of environmentalists and economic, social justice, and sustainable development advocates. As a result, ratification and implementation of the UNWC could help make both the IJC and the IBWC more relevant by increasing the focus on, and energy devoted to, the more sustainable conservation and management of transboundary waters and related resources in all three countries. Whether and the extent to which Canada, Mexico and the USA have substantive objections to the UNWC is not well known. This may be because such objections are masked by the fact that all three countries were among, not just the 103 countries who voted in favor of the UNWC, but also the 38 countries to officially sponsor the UNWC. will crucially depend on eliminating both the overlap between the draft and the UN Convention in terms of the physical subject matter they regulate, and the notion of “sovereignty” over shared groundwater, which should have no place in any set of rules governing the use, protection, and management of shared freshwater resources. At the political level, the ratification and implementation of international treaties has become an increasingly challenging undertaking in all three countries. A recurrent question in discussions about water management in Canada is “What is the role of the federal government?” A stranger to these discussions might think, naively, that this is simply a constitutional question. But even a good constitutional lawyer can not give a crisp answer. To some extent the question is a political one – “What does the federal government think its role is, at the moment?” This changes. As a practical matter this means that ratification and implementation of the UNWC in Canada would likely trigger challenging and hard-nosed fiscal and other negotiations among the federal, provincial and First Nations levels of government. An analogous situation occurred when Canada was asked to ratify and implement the Espoo Convention on Environmental Impact Assessment in a Transboundary Context. In the USA, the legal situation regarding international treaties is somewhat different, but possibly even more challenging. Under United States constitutional law, an international “treaty” is an agreement that has received the “advice and consent” of two-thirds of the United States Senate and has been ratified by the President (see here). As a practical matter, given the increasing political polarization within the United States Senate, obtaining the consent of two thirds of Senate members for any multilateral treaty, including the UNWC, would be exceedingly challenging. Mexico is much closer to Canada constitutionally than to the USA as Mexico constitutionally allocates separate and exclusive spheres of authority to the states/provinces and the federal government. International treaties must conform to the Mexican Constitution in order to be valid. However, many international treaties address topics that in Mexico fall within the exclusive authority of the states/provinces. Seemingly, in practical terms this means that Mexico may need to enact domestic legislation to transform international treaty obligations into enforceable domestic law, which could be both time consuming and expensive. there is nothing more difficult to take in hand, more perilous to conduct, or more uncertain in its success, than to take the lead in the introduction of a new order of things. Because the innovator has for enemies all those who have done well under the old conditions, and lukewarm defenders in those who may do well under the new. This coolness arises partly from fear of the opponents, who have the laws on their side, and partly from the incredulity of men, who do not readily believe in new things until they have had a long experience of them. Despite the apparent obstacles noted above, there are at least three compelling reasons why Canada, Mexico and the USA should immediately ratify and implement the UNWC. First, ratification and implementation will send a strong and important message to each other, and to the world community, generally, that sovereign states have important rights and responsibilities when it comes to transboundary freshwater resources. Second, the fact that Canada and the USA are variously both upstream and downstream of each other and that the USA is upstream of Mexico, will particularly and importantly help dispel any lingering misperception that the UNWC may be biased in favour of downstream or upstream states. Third, Canadian, Mexican and American support for the Convention could not be more timely given how the world community is currently struggling with the harsh realities of climate change and water scarcity. Ratifying and implementing the UNWC in North America would also demonstrate a wider acceptance of practice under the Convention as representing customary international law. In turn this could place the UNWC higher on various political agendas and could help lead to a more stable framework for transboundary water cooperation globally. The following post is by Gabriel Eckstein, Director of the International Water Law Project, Professor of Law at Texas Wesleyan University, and Of Counsel with Sullivan & Worcester. He can be reached at gabriel [at] internationalwaterlaw.org. This post is based on a new article by the same title. The nearly 2,000 mile-long border between Mexico and the United States is hot and dry. Few rivers cross this arid expanse. Yet, despite the lack of visible, life-sustaining water, the region is growing – the combined border population, currently around 14.4 million, is expected to increase 40% by 2020. The reason for this remarkable growth is ground water, more specifically, transboundary aquifers. As many as twenty aquifers straddle the Mexico-U.S. border, many of which serve as the primary or sole source of fresh water for the border’s communities and unique ecosystems. Notwithstanding the undeniable importance of the region’s transboundary aquifers, neither Mexico nor the United States seem inclined to pursue a border-wide pact to coordinate management of these critical freshwater resources. While recommendations have been proffered for more than forty years, all appear to have fallen on deaf ears. As a result, these resources are now being overexploited on both frontiers as populations and industries pump with little regard for sustainability or transboundary consequences. Moreover, these subsurface reservoirs are being fouled by untreated wastes, agricultural and industrial by-products, and other sources of pollution. Imminently unsustainable, the situation portends a grim future for the region. If both federal governments are unwilling to take decisive steps, what else can be done? Are there alternatives to a formal, comprehensive, border-wide regime that would address the complexity and multitude of issues related to the various transboundary aquifers on the border? In a recently published article, I advocate for an alternative approach, one that sidesteps the respective federal authorities and places the burden of pursuing cross-border cooperation on the communities that so depend on these critical fresh water resources. Essentially, I propose that subnational entities at the local and regional level pursue cooperation over transboundary aquifers in the form of informal, locally-specific, cross-border arrangements. While this tactic challenges the national governments’ traditional monopoly over international relations, especially as they relate to transboundary natural resources, there is good reason to believe that such an approach could achieve what Mexico City and Washington, DC have failed (or declined) to do – create effective collaborative schemes for the mutual and sustainable management of the region’s transboundary aquifers. Under the unique circumstances of the Mexico-U.S. border, informal and quasi-formal arrangements are more likely to create viable cross-border pacts that would be respected by the local communities. The degree of interest that the national authorities have in a local issue is often directly proportional to the physical distance from the capitol. In contrast, local decision-makers are typically better informed about local and regional cross-border concerns than federal bureaucrats, especially on issues related to the management of local fresh water resources. Moreover, local authorities are better able to reflect the values and preferences of those most likely to be affected by a water accord with a neighboring country, which, for a local border community, is merely a short drive away. Critically, local decision-making would likely be more sustainable, as well as responsive and adaptable to changing climatic and economic circumstances and improved knowledge, given that the local communities and their children will have to live with their decision far into the future. In addition, a local approach to the management of transboundary aquifers makes hydrologic sense. No two aquifers are alike; each functions as a complex and unique hydrological system. Moreover, no two aquifers are perceived equally by overlaying communities, especially where those communities are highly dependent on the resources to meet their daily freshwater needs. Hence, aquifers traversing the Mexico-U.S. border cannot be managed effectively through a single, comprehensive, border-wide treaty. While a border-wide scheme may be politically convenient, such an approach could only offer very general guidelines and standards, and may prove detrimental to the sustainable management of some of the region’s subsurface waters. Rather, an effective, sound, and equitable management plan should be tailored to each transboundary aquifer’s unique characteristics and circumstances. One concern often raised with a local approach to the management of transboundary natural resources is the legality of such action. As is true under most nations’ foundational instruments, both the Mexican and the U.S. constitutions recognize the national government as the sole authority empowered to deal with foreign representatives; they prohibit states, cities, and other subnational political units from entering into treaties and other formal relations with counterparts across the border. The goal here, however, is not to create multiple, locally-specific, formal treaties throughout the border. Rather, the goal is the development and implementation of informal or quasi-formal, locally-specific, cross-border arrangements that are implemented through cooperative understandings or memorandum of understanding, or more structured contracts for goods or services. In the United States, while the former would be immune to Constitutional scrutiny due to their unofficial, unenforceable, and non-binding nature, the latter would be immune to the extent that the U.S. Congress has not preempted such activities under its authority to regulate interstate commerce. Given the state of the economy, domestic and international terrorism, drug wars, and other societal and political challenges, ground water on the Mexico-U.S. border is not a priority of the Mexican and American governments. Unfortunately, that lack of prioritization is jeopardizing the long-term viability and habitability of the border area and portends the possible downfall of many communities and ecosystems throughout the region. The two federal governments, though, are not indispensable for developing sustainable and coordinated ground water relations on the border. Through informal locally-specific, cross-border arrangements, frontier communities can, on their own, achieve viable cross-border pacts that will ensure the water futures of their peoples, economies, and environment. For a more comprehensive consideration of this proposal, please see my recently published article. The following post is by Regina M. Buono, an associate attorney with the law firm of McGinnis, Lochridge, & Kilgore L.L.P in Austin, Texas. She can be reached at rbuono [at] mcginnislaw.com or found on Twitter as @ReginaBuono. The Colorado River provides water to more than 36 million people in the western United States and Mexico. Management of the river is governed by the Treaty for the Utilization of Waters of the Colorado and Tijuana Rivers and of the Rio Grande, which was signed in 1944 (“1944 Water Treaty”). While the treaty is generally viewed positively for having served as a basis for successful cooperation for nearly 70 years, efforts to comply with its terms have occasionally been strained. This was especially evident early last decade when Mexico fell behind in treaty-mandated water deliveries to the Rio Grande as a result of a prolonged regional drought. In response to ongoing climatic changes and uncertainties, the 1944 Water Treaty was recently amended by Minute 319 to provide for both nations to share surpluses and water shortages, permit Mexico to store some of its allotted water in the United States, facilitate investment in Mexico’s water infrastructure, and restore the environmental flows of the Colorado River to the Gulf of California, albeit on an experimental scale. Minute 319 allows Mexico, which has a dearth of storage capacity, to store some of its Colorado River allotment in Lake Mead, located in Arizona and Nevada. This arrangement is an extension of Minute 318, which modified the 1944 Water Treaty after an earthquake in the Mexicali Valley in 2010 severely damaged Mexico’s canal-based water distribution system. In addition to enhancing Mexico’s storage capacity and water security, the deal helps keep the water level in Lake Mead more predictable, which in turn protects the water intake pipes that supply the vast majority of Las Vegas’ drinking water. Minute 319 also grants the U.S. a one-time allotment of 124,000 acre-feet of water in return for U.S.-financed infrastructure improvements in Mexico. The infrastructure improvements are intended to generate water savings that will benefit all river users. In addition, the amendment permits the U.S. to send less water to Mexico in drought years, thereby sharing the burden previously borne solely by U.S. water users. It allows for the creation of an Intentionally Created Mexican Allocation (“ICMA”), wherein Mexico may adjust its water delivery schedule to allow for later use. Mexico may adjust its order in dry years to offset the mandated reduction with deliveries from the ICMA or other water previously deferred. In years in which Lake Mead is projected to be at or above certain elevations and in which Mexico has deferred delivery of or created a certain minimum amount of water, Mexico may increase its order for river water in specified increments based on the water elevation. However, the annual delivery of deferred water may not exceed 200,000 acre-feet and total annual delivery may not exceed 1.7 million acre-feet. Finally, the amendment creates a pilot program to provide water to be used as environmental flows for the Colorado River delta, which will benefit the river and the myriad species that are found there. The delta has been largely dry for decades; most years the flow of the river is diverted before reaching its mouth at the Upper Gulf of California, leaving the river channel completely dry more than 90 percent of the time and damaging the delta ecology and wetlands that once covered the region. Minute 319 requires water users in the U.S. and Mexico to provide a one-time high-volume “pulse” flow of 105,000 acre-feet, which will augment base flows secured by a water trust since 2008. Scientists and advocates hope that the pulse and base flows will create 2,000 acres of new wetland habitat and will lay the groundwork for more extensive restoration projects. Minute 319 offers a number of benefits for both nations, as well as the water utilities and environmental organizations that depend on and care for the river. On a practical level, Minute 319 provides water departments, cities, states, and other political subdivisions that rely on the Colorado River for fresh water with the added benefit of certainty and peace of mind, which will allow them to make better business decisions and allocate risk more precisely. Moreover, investment in Mexico’s infrastructure (e.g., concrete-lined canals instead of the current dirt channels) will benefit water users throughout the basin as a result of greater efficiency and reduced waste, which will allow conserved water to be shared with those entities that helped finance improvements. Although the amendment has generally been received favorably by water and governmental entities alike, it is not without its critics. Not everyone shares the opinion that allowing Mexico to store water in the lake is an unqualified good, and some have voiced resentment that domestic water users have not been granted the same flexibility. The Imperial Irrigation District, a primarily agricultural water district in California and the largest single recipient of Colorado River water, refused to sign the agreement because it wanted to have the same ability as Mexico to bank its water in Lake Mead. Some parties have expressed concern that keeping more water in Lake Mead means that less water will be available for hydroelectric power generation and, because water levels in the lake serve as a drought indicator, that changes in the lake’s levels due to Mexico’s ability to store water could delay a declaration of drought, in turn postponing necessary distribution reductions. The Confederación Nacional de Campesinos, Mexico’s national farmers’ association, has also expressed concerns, calling upon farmers to present a “united front” against the agreement, which it believes will harm agricultural producers’ economic interests. Despite differences of opinion over its impact, the most important aspect of Minute 319 may be the basis it creates for future cooperation as the river is further impacted by overuse, drought, and climate change. Scientific research and environmental models have demonstrated that the American southwest has been impacted by and will continue to suffer from the effects of climate variability. It is also an area with a rapidly growing population. While the region presents a challenge to water and environmental scientists and managers, as well as for society generally, this agreement may serve as an example of creative cooperative management for other countries facing water-related challenges. Disagreements over water resources are projected to be a leading cause—if not a primary cause—of cross-border social and political conflict in decades to come. Accordingly, strengthening ties between Mexican and U.S. governmental officials, scientists, and water managers is critical for facilitating future cooperation and minimizing tensions. The successful completion of this negotiation presents a precedent for cooperation going forward, and the relationships forged in the process will be valuable for future compromises over the management of the Colorado River, as well as other transboundary waters on the border. Minute 319 is limited to a term of five years. The short duration may have been necessary to facilitate the amendment’s acceptance by Mexican officials, as Mexico has long considered the 1944 Water Treaty to be inviolable and complained about American management practices. Nevertheless, officials on both sides have expressed the hope that the Minute’s implementation may be extended in the future. Jeff Dornbos, an associate at Warner Norcross & Judd LLP, provided the following guest post. He recently published an article, “All (Water) Politics Is Local: A Proposal for Resolving Transboundary Water Disputes” in the Fordham Environmental Law Review (here). In this guest post, he discusses how some of the lessons presented in that article apply to the Columbia River Treaty renegotiation. Jeff wishes to thank Laura Rogers-Raleigh for her valuable research assistance. On April 2, 1984, the United States and Canada entered into a treaty that ended the High Ross Dam controversy, a protracted dispute over a proposal to raise the height of a hydroelectric dam located on the Skagit River in Washington State. Analysis of the dispute resolution processes, and the successful outcome of the treaty, suggest that there are several advantages to organizing transboundary-water-dispute negotiations around hydrologic boundaries rather than political boundaries. The High Ross dam, a hydroelectric dam that generates power for Seattle, is built on the SkagitRiver, which flows from the Canadian provinceof British Columbia, across the border, and into the state of Washington. The controversy arose when Seattle Light Company developed a proposal to raise the dam in order to meet its growing demand for energy. Following through with the proposal would have generated more electricity for the city of Seattle, but it also would have flooded approximately 5,475 acres of pristine wilderness in British Columbia. Ultimately, after lengthy efforts to resolve the issue, the United States agreed not to raise the height of the dam in exchange for a long-term supply of electricity from Canada, at the price it would have cost to raise the dam. Resolution of the High Ross Dam controversy was hailed as a success on both sides of the border. President Reagan noted that it was “constructively and ingeniously settled.” Canada’s external affairs minister and the U.S. Secretary of State said it could serve as a model for resolving other transboundary disputes. It was the process, however, not the resolution, that was the most interesting aspect of the dispute. Specifically, the successful negotiations took place between representatives of Seattle and British Columbia, not high-level officials from Ottawa and Washington. According to one negotiator involved in the process, both American and Canadian government officials told local officials to figure it out and then report back when they had a solution. In the end, it was the local negotiators who played the key role in resolving the dispute. At least two studies of the controversy (an oral history project and a research paper that based its findings largely on interviews) suggest three factors contributed to the success of the negotiations: First, even though it was a transboundary dispute, local negotiators, with local knowledge and a stake in the outcome, played a central role in resolving the dispute. These negotiators were able to balance different interests without getting caught up in other, unrelated, disputes between the two countries. Second, the resolution included the participation of a variety of interest groups. Third, the availability of both scientific and experiential knowledge was useful in achieving a mutually acceptable resolution. As the authors of the Oral History Project stated, “experiential knowledge is not clearly distinct from scientific knowledge – the two inform and influence each other to create a more richly textured public wisdom.” Involving local negotiators helped to ensure availability of sound scientific and experiential knowledge regarding the transboundary water body. These three lessons are consistent with three fundamental aspects of transboundary water resource management: fostering long-term cooperation, ensuring public participation, and gathering accurate data. Each of these is a focus of well-known water and environmental instruments, including the Berlin Rules, the Rio Declaration, and the Watercourses Convention. Long-term cooperation is necessary to avoid the tragedy of the commons (the prisoner’s dilemma provides another useful analogy). Accurate data gathering is essential for evaluating how the actions of those using the water resources will impact it in both the short and long term. And public participation is justified both as an ends in itself and as a mechanism for better decision making. The three lessons are also consistent with the “watershed approach” to managing water systems whereby management of water resources is based on the boundaries of the watershed rather than political boundaries. The approach is based on the understanding that political boundaries are not always the best demarcation lines for managing water resources because watersheds often cross jurisdictional and political boundaries, including international frontiers The lessons of the High Ross Dam controversy also mirror very well the EPA’s three guiding principles to the watershed approach: getting those most directly affected by decisions involved in the decision making, focusing on the geographic boundaries of the water body, and basing decisions on strong science and data. The International Joint Commission (IJC) recognizes that the watershed approach provides a useful framework for managing transboundary water resources. In one report, for example, the IJC highlighted resolution of the High Ross Dam controversy as one of its achievements in fostering transboundary environmental management. In that same report, developed in response to a request from the United States and Canada to provide proposals for how to best assist in meeting the “environmental challenges of the 21st century,” the IJC suggested developing international watershed boards to help resolve transboundary water disputes between the United States and Canada. The High Ross Dam provides useful lessons for future transboundary water agreements, such as the renegotiation of the Columbia River Treaty. The treaty, originally ratified in 1964, resulted from the desire of both the United States and Canada to cooperatively manage the Columbia River in order to control flooding and provide electricity. Pursuant to the treaty, the two countries constructed dams to generate electricity and regulate flooding, which have provided significant benefits to citizens of both nations. Notwithstanding these benefits, some residents of the basin criticize the treaty, and construction of the dams, for leading to the flooding of fertile farmland, displacement of 2,300 residents, loss of tribal cultural sites, and destruction of wildlife habitats. Specifically, many residents of the basin argue that they were not given sufficient input in the original treaty negotiations. On the Canadian side, for example, dissatisfied residents have established the Columbia Basin Trust. The group’s stated function is to provide “advice on meaningful consultation processes with Basin Residents and local governments on any process to amend, renew or terminate” the Treaty. South of the border, the United States established a Sovereign Review Team that includes representatives from states, tribes, and relevant organizations, tasked with delivering recommendations for the future of the Treaty. Although local groups are being given the opportunity to provide input on the renegotiation process, the Columbia River Treaty presents at least two opportunities for further involvement from local stakeholders. First, beyond simply getting input from local stakeholders, local negotiators could be empowered to participate in the negotiation process. Second, the treaty could be renegotiated to include the establishment of a watershed board, comprised of local experts and stakeholders from the basin, empowered to negotiate resolutions to disputes. Article XVI of the treaty, for example, could be amended to give this watershed board the ability to assist in settling differences. The board would be established around the geographic boundaries of the basin, tasked with studying the basin, and empowered to help settle differences that arise over time. Transboundary water resources, by definition, do not fall neatly into political or jurisdictional boundaries. International transboundary water resources are not rare, as demonstrated by a United Nations-supported report, estimating that nearly half of the world’s population lives “in river and lake basins that comprise two or more countries.” Developing sophisticated international watershed boards is unlikely to be feasible in many of these transboundary basins. But the lessons from the successful resolution of the High Ross Dam controversy suggest that there are advantages to structuring negotiations over transboundary water disputes around hydrologic boundaries, not just political boundaries. While international disputes may often require some involvement of “high-level” officials, these officials should look to the boundaries of the watershed at issue and involve local stakeholders who are as closely aligned as possible to that watershed. Transboundary water agreements, for example, could include a rebuttable presumption that negotiations over transboundary water disputes begin with identifiable groups organized at the most decentralized hydrological level. Ultimately, including this rebuttable presumption would help to meet the goals of fostering long-term cooperation, promoting public participation, and gathering accurate data, such as were keys to resolving the High Ross Dam controversy. You are currently browsing the archives for the North America category.